One of the most popular features in NGINX Plus is live activity monitoring, also known as extended status reporting. The live activity monitor reports real-time statistics for your NGINX Plus installation, which is essential for troubleshooting, error reporting, monitoring new installations and updates to a production environment, and cache management. We often get questions from DevOps engineers – experienced and new to NGINX Plus alike – about the best way to configure live activity monitoring. In this post, we’ll describe a sample configuration file that will have you viewing real-time statistics on the NGINX Plus dashboard in just a few minutes. The file is a preview of the set of sample configuration files that we’re introducing in NGINX Plus R6 to make it even easier to set up many of NGINX Plus’ advanced features in your environment. The set of examples will grow over time, and the NGINX Plus packages available at cs.nginx.com will include the latest versions available when the packages are created. You can download the first sample configuration file, for live activity monitoring, in advance of the release of NGINX Plus R6 next week (the file works with NGINX Plus R5 too). Here we’ll review the instructions for installing and customizing the file. Note: These instructions assume that you use the conventional NGINX Plus configuration scheme (in which configuration files are stored in the /etc/nginx/conf.d directory), which is set up automatically when you install an NGINX Plus package. If you use a different scheme, adjust the commands accordingly. The commands do not include prompts or other extraneous characters, so you can cut and paste them directly into your terminal window. Download the sample configuration file and rename it to status.conf. Customize your configuration files as instructed in Customizing the Configuration. Test the configuration file for syntactic validity and reload NGINX Plus. 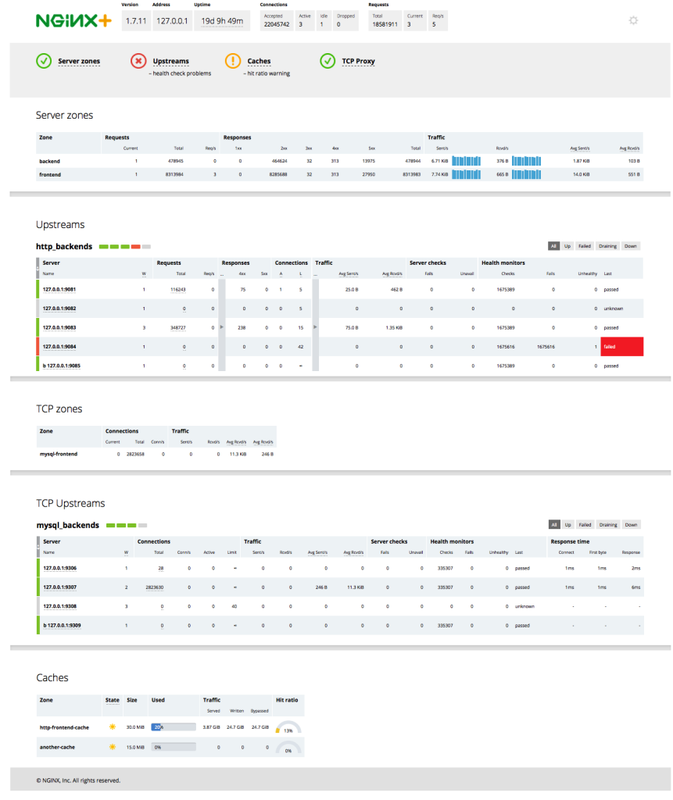 The NGINX Plus status dashboard is available immediately at http://nginx-server-address:8080/ (or the alternate port number you configure as described in Changing the Port for the Status Dashboard.). To get the most out of live activity monitoring, make the changes described in this section to both the sample configuration file and your existing configuration files. For statistics about virtual servers and upstream groups to appear on the dashboard, you must enable a shared memory zone in the configuration block for each server and group. The shared memory is used to store configuration and run-time state information referenced by the NGINX Plus worker processes. If you don’t configure shared memory, the dashboard reports only basic information about the number of connections and requests, plus caching statistics. In the figure in Preview of the NGINX Plus R6 Dashboard, this corresponds to the first line (to the right of the NGINX+ logo) and the finalCaches section. Similarly, you must add the zone directive to the upstream configuration block for each upstream group you want to appear on the dashboard. The following example allocates 64 KB of shared memory for the two servers in the upstream-backend group. The zone name for each upstream group must be unique. IP address-based access control lists (ACLs). In the sample configuration file, uncomment theallow and deny directives, and substitute the address of your administrative network for10.0.0.0/8. Only users on the specified network can access the status page. HTTP basic authentication. In the sample configuration file, uncomment the auth_basic andauth_basic_user_file directives and add user entries to the /etc/nginx/users file (for example, by using an htpasswd generator). If you have an Apache installation, another option is to reuse an existing htpasswd file. Client certificates, which are part of a complete configuration of SSL or TLS. For more information, see NGINX SSL Termination in the NGINX Plus Admin Guide and the documentation for the HTTP SSL module. Firewall. Configure your firewall to disallow outside access to the port for the dashboard (8080 in the sample configuration file). To set the port number for the dashboard to a value other than the default 8080, edit the followinglisten directive in the sample configuration file. If your NGINX Plus server has several IP addresses and you want the dashboard to display tatistics for only some of them, create a listen directive for each one that specifies its address and port. The sample configuration script includes the following example that you can uncomment and change to set the correct IP address. You also need to comment out the listen directive (with a port number only) discussed in Changing the Port for the Status Dashboard. Here’s a sneak peek at the new NGINX Plus dashboard, which we’re unveiling next week in NGINX Plus R6.